A New York court has ruled that the body of Archbishop Fulton Sheen can be moved from St Patrick's Cathedral in New York to the Cathedral of St Mary in Peoria, in the diocese which has opened the cause for his canonisation. Source: Catholic News Agency. The Superior Court of New York court ruled on Friday in favour of Joan Sheen Cunningham, who had petitioned to move the body of her uncle, Venerable Archbishop Sheen, to Peoria from New York. “This is the second time that the Superior Court of New York has ruled in favour of Joan Sheen Cunningham’s petition,” read a statement from the Peoria diocese. 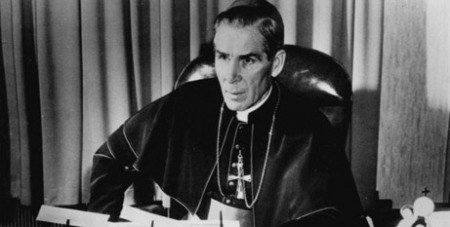 The judge, Arlene Bluth, ruled that “the location of Archbishop Sheen's final resting place would not have been his primary concern” and that “it makes no sense, given his lifelong devotion to the Catholic Church, that he would choose a location over the chance to become a saint”. The Peoria diocese opened the cause for Archbishop Sheen’s canonisation in 2002 after the Archdiocese of New York said it would not explore the case. In 2012, Benedict XVI recognised the heroic virtues of the archbishop. The Archdiocese of New York, however, has said that Vatican officials have said the Peoria diocese can pursue Sheen’s canonisation regardless of whether his body is at rest there. Archbishop Sheen was born in Illinois in 1895, and was ordained a priest of the Diocese of Peoria. He was appointed auxiliary bishop of New York in 1951, and then Bishop of Rochester in 1966. He retired in 1969 and moved back to New York City until his death in 1979. He was the pioneering host of the Catholic Hour radio show and the television show Life is Worth Living and authored many books.